“It took Noah 120 years to build the ark.” Wait. What? My understanding of Noah and his cruise through the floodwaters of the world has been shaped significantly by the cartoonish tellings of children’s Bibles with the sweet pictures of animals snuggly resting and the rhyming words that gloss over the reality of what was under the water. My understanding looks something like this: Noah gets a word from God to build a boat. God gives him very specific instructions about size and shape and cargo. Noah gets busy and finishes just in time to load the animals before the deluge hits, killing all life except what is on that boat. I remember studying the flood in college. There, we read a number of flood stories from a number of different religions. Based on the prolific motif of a flood destroying the earth found throughout early literature, we can safely assume that such a thing happened, so concluded that professor. Well, it appears to be Noah week in the drama of my life. On Tuesday, we studied the life of Noah in Bible Study. My son Joseph is learning about Noah in preschool. In fact, he wore a green shirt and brought two stuffed animals to school today so that his class could form a rainbow (based on shirt color) and an ark-like zoo (hence, the stuffed animals). And last night, the Bible story I blindly pulled off the shelf to read to my kids was… yep, Noah. So, Noah. The Bible tells us specifically that he was 500 years old when he had his first son and he was 600 when the flood started. He was 601 when he finally left the ark. He was a righteous man who walked with God and did exactly what God told him to do. And my Bible study commentary says that it took Noah 120 years to build the ark. Curious, I looked at Genesis 5-9, the story of Noah, over and over again in a number of translations. All I could see there was in Genesis 6:3 where God makes a promise that in 120 years He is going to wipe out the earth. Fed up with the evil, sad that He had created His creation, God says “Enough.” 120 years and the game’s up. But because Noah is righteous, God will save him and his family and seven pairs of every animal, bird, insect. (I feel like singing… “The Lord said to Noah, ‘There’s gonna be a floody floody.’ Lord said to Noah, ‘There’s gonna be a floody floody. Get those animals out of the muddy muddy. Children of the Lord.’”) So, I turned to the internet. Turns out there is a lot of discussion about how long it took Noah to build the ark. Hypotheses range from 50 to 75 to 120 years based on God’s promise of destruction and salvation, when Noah had his sons, when they were old enough to have wives, etc. I felt discouraged. Noah taking 120 years to build the ark seemed so dramatic and cool. 50 years? Not so much. But, really, that’s ridiculous on my part. Can you imagine the situation? You’re far away from the sea. You are a farmer. You start building a large boat in your backyard. Why? Because God told you to. It doesn’t really matter how long it took. If it took 120 years, wow, that’s a long time to believe, follow through, and obey. If it took 75 years, wow, that’s a long time to believe, follow through, and obey. If it took 50 years, wow, you get the picture. Perseverance. Noah stuck it out. One has to believe that he took some grief for his grand boat project. “Crazy old Noah! Always good for a laugh!” must have been the taunting around the neighborhood. After all, the Bible tells us that Noah was the only righteous man to be found. Therefore, it is safe to conclude that no one else knew God and/or if they had heard of Him they certainly didn’t believe, follow, or obey. Yes, Noah must have been the subject of many jokes. But he persevered. With the jokes, were there other nuisances? Or even threats? If Noah knew that God was about to destroy the world and if he was telling the naysayers why he was doing what he was doing, which the Bible tells us he knew and he did, don’t you think there might have been some who were angered by the message? Who thought Noah was too proud and needed to come down a peg? Who might have tried to sabotage his work? Or who mocked Noah at every turn? “Where’s the rain, Noah? Where’s the flood? You’ve been working on this for 50 (or 75 or 120) years. Do you really believe this God is going to do what He says? Don’t you think maybe you just made this up in your mind?” But Noah persevered. Do you know any Noahs today? People who buck convention, stick it out, persevere through thick and thin? People who seek to follow God’s ways, obey His commands, walk with Him even when the rest of the world is laughing? A couple of our Compassion Tea directors are currently preparing for a trip to Africa this summer. While there, they will be distributing supplies, visiting clinics, taking notes about what is needed at the clinics, and well, frankly, risking their safety and certainly their comfort. Facing this huge trip must feel daunting, something like building an ark. How much and what is needed for the trip? How to collect medical supplies? How to carry those supplies to Africa? Once there, they will run across lots of other Noahs who are building arks in the shape of medical clinics and churches, who are tending to the most basic needs of their fellow man in places where voodoo is still the preferred method of medical treatment and where supplies for treating even the most basic illnesses are scarce. One of the clinics they will be visiting has a recently donated x-ray machine. This is new technology for the clinic. The machine is all set up and ready! But there is no one trained in how to use it. So it sits unused. Another clinic has patiently been waiting for its running water to be restored. They’ve been waiting for 2 years. The funding is there, but getting anything done in Africa is kind of like building an ark in the middle of a desert. It takes a whole lot of perseverance. The kind of perseverance that has led one of the missionaries with whom CompassioNow works to return to Africa after medical time off in the States. This missionary has celiac disease and has to eat gluten-free. Rural Africa doesn’t understand gluten-free. But for the sake of fulfilling God’s calling on her life, this missionary is stocking up on gluten-free food and heading back. Fulfilling God’s calling is rarely easy. Whether it is building an ark in the desert or running a tea company or traveling to Africa to bring supplies and comfort, it takes a special brand of perseverance. I am pretty sure that when Noah heard God shut the door behind him and saw the waters pour forth from heaven and earth, he was infinitely glad he had listened and obeyed. Once the first x-ray is taken, once the first drops of water flow into the clinic, once the missionary sees the smiling face of a goo-goo (grandma in Africa), there will be much joy and relief. When our Compassion Tea directors deliver duffle bags of pharmaceuticals and medical supplies to clinics in Africa, there will be much joy and relief. When the directors return from Africa, there will be much joy and relief, too. But it will take continued perseverance for all of these things to happen… and a lot of tea! That’s where you can step in! By drinking tea, by joining our membership, you can help the directors collect medical supplies to take to Africa. By drinking tea, by joining our membership, you can help CompassioNow send medical supplies to the clinics in other parts of Africa. By drinking tea, by joining our membership, you can provide funding for staff and water projects and other projects. We would love to welcome you aboard our ark! Not long ago, I made the Saturday morning trek to the Farmer’s Market downtown. I love the Farmer’s Market… all the fresh fruits and vegetables, flowers, organic breads, and even the balloon man. Usually, I stop to chat with a local olive oil producer whose olive oils are amazing. (Olivina if you are interested!) This day, I mentioned my work with Compassion Tea to Charles and his ears literally perked up. “I drink way too much soda,” he shared. “I’m looking for a new beverage that doesn’t have as much sugar in it.” Well, you can imagine the next 30 minutes! Duh! ICED TEA! I’m not sure what sparked Charles’ decision to alter his drinking habits, but it seems to be a trending topic. You may have noticed on September 14 that New York City’s Board of Health approved Mayor Bloomberg’s ban on 16 oz. soda and/or sweetened drinks. Effective March 12, 2013, this ban will prohibit any beverage with more than 25 calories per eight ounces from being sold in a container larger than 16 ounces. So, basically, in 6 months’ time, when you take in your weekly movie or swing through Jack-in-the-Box in New York City, you won’t be able to buy the mega beverage of your choice. You can, however, drop into the grocery or 7-Eleven and purchase a 2 liter or a Big Gulp. And at the restaurants, you may have as many refills in your smaller cup as the restaurant will allow. The reason behind the ban? According to Mayor Bloomberg, banning these drinks will “curb obesity” and “save lives.” To read more about this, click here and here. Okay, so don’t travel to NYC if you plan on consuming large amounts of Pepsi. Maybe stay in Trenton instead. This week, the New York Times ran an article in the opinion section of the paper titled, “Is Alzheimer’s Type 3 Diabetes?” In the article, Mark Bittman explains the scientific advances that are suggesting a link between the body’s reaction to too much sugar over long periods of time, the development of type-2 diabetes, and the similarities between type-2 diabetes and Alzheimer’s. In fact, studies with rats have shown that, when the insulin in the brains of the rats is limited, the brains of the rats “show all the signs of Alzheimer’s.” (Bio refresher: Insulin is released by the pancreas and goes knocking on the doors of cells telling them to open up and grab the glucose, which is what the body turns sugar into, coursing past in the blood. When insulin becomes a constant, persistent, and annoying knocker, which is what happens when we consume large amounts of sugar regularly, the cells become “insulin resistant;” they stop listening and refuse to open the door. This is damaging to blood vessels, the heart, and other organs, and causes the kind of damage to the brain noted in the article.) The article goes on to discuss the implications of this study from a health perspective and from a “cost-to-society” perspective. It also adds the caveat that while sugary drinks and foods are instrumental in increasing the rate of type-2 diabetes in Americans, sugar may not be the only culprit. Heavily processed foods certainly have their place in the decline of American health, too, according to the article. Interestingly enough, I was recently reading an update from Karero Medical Clinic in Kenya… yes, as in Africa. A team of doctors and dentists from the States had recently visited the clinic and had provided dental services to “dozens of people.” Rev. Jeff Spainhour, from North Carolina, was among the delegation of professionals who traveled to Karero. After watching the extraction of countless teeth among the Kenyans, Rev. Spainhour commented, “It was obvious that sugar has had a great negative impact on the health of the people seen.” Even in Africa, sugar is becoming the boogie man. It starts with the teeth, spreads to diabetes, and may even lead to the most mind-debilitating disease we know. • Green tea: Made with steamed tea leaves, it has a high concentration of EGCG and has been widely studied. Green tea’s antioxidants may interfere with the growth of bladder, breast, lung, stomach, pancreatic, and colorectal cancers; prevent clogging of the arteries, burn fat, counteract oxidative stress on the brain, reduce risk of neurological disorders like Alzheimer’s and Parkinson’s diseases, reduce risk of stroke, and improve cholesterol levels. • Black tea: Made with fermented tea leaves, black tea has the highest caffeine content and forms the basis for flavored teas like chai, along with some instant teas. Studies have shown that black tea may protect lungs from damage caused by exposure to cigarette smoke. It also may reduce the risk of stroke. • White tea: Uncured and unfermented. One study showed that white tea has the most potent anticancer properties compared to more processed teas. • Oolong tea: In an animal study, those given antioxidants from oolong tea were found to have lower bad cholesterol levels. One variety of oolong, Wuyi, is heavily marketed as a weight loss supplement, but science hasn’t backed the claims. So what? I realize people like soda. I grew up drinking it and I haven’t grown two heads or sprouted wings or anything too bizarre. But when it comes to health and making healthy choices for me and my family, I’m inclined to avoid things that contribute to obesity (goodness gracious, I have enough trouble keeping off the pounds! ), tooth decay, and now possibly Alzheimer’s. Yes, soda offers variety and flavor and caffeine and a cool, refreshing pick-me-up or get-me-going boost. But, I have to argue that tea is even better. As a Compassion Tea drinker, I find plenty of flavor and variety in our offerings, enough to keep my changing palette intrigued and satisfied. And because of the intense and robust flavors, I don’t need to add sweeteners to the teas to improve flavor. If I want sweet, there’s Provence or Bourbon Street Vanilla or Almond Rocker or Jasmine Vanilla Rooibos or our new flavor Caramel Rooibos in the pyramid bags. If I want fruity, well, that selection is endless. From blueberry to mango, we’ve got fruit! For a spicy mood, there’s West Cape Chai, Cochin Masala Chai, or Spicy Rooibos. If I’m looking for something gentle and delicate, there’s Sencha Cherry Rose or Peony White Needle or Silver Needle or even Coconut Oolong or Jade Cloud. And of course, there’s always the oolong, pu’ erh, and black teas, which offer that robust cup, the get-me-up-and-going cup of tea. Tea is varied and as long as we don’t pour in a pint of sugar it is healthier than soda. Why not make it your beverage of choice! Every morning, I run the same drill. Feet hit the floor and the ankles and heels start screaming. I stumble toward the bathroom to grab something warm and my phone and then head outside with the dog to mincingly make my way down the driveway to get the newspaper. I check emails as I go and then glance at the day’s headlines on the way back up the driveway. This morning, I laughed out loud when I opened my inbox. There, thanks to Princess Cruises, was the single most clever ad campaign I have ever seen. Concerned that I might be “tired of all the negative news,” Princess Cruises is offering “The Campaign to Escape Completely!” From now until Election Day, the cruise-line is giving away free cruises where you can really and truly escape from the media for a few days. Floating on a big boat, with food readily available, pools aplenty, and no TV or newspapers? Right on! Sign me up! So, what does this have to do with tea? Not a whole lot, truth be told! I can offer you the chance to relax and unwind with a cup of tea… maybe one of our new flavors? Have you tried Jade Cloud or Bai Hao or Coconut Oolong or West Cape Chai yet? Or the Lavender Sage Rooibos or Lemon Mint Rooibos are fantastic for centering and grounding… as long as you leave your media outlets turned off. Tea is very relaxing. Waiting for the water to boil, watching the leaves steep, pouring a cup, taking the first slurp… all are steps in patience, settling down, calming, breathing more deeply, creating a mood for contemplation. Take some time. in his two hands, or measured the sky between his thumb and little finger? weighed each mountain and hill? or taught him his business? what school would he attend to learn justice? What god do you suppose might have taught him what he knows, showed him how things work? Why, the nations are but a drop in a bucket, a mere smudge on a window. like so much dust off the floor! nor enough animals in those vast forests to furnish adequate fuel and offerings for his worship. All the nations add up to simply nothing before him— less than nothing is more like it. A minus. 21 – 24: Have you not been paying attention? Have you not been listening? Did you catch that? Nations are like a drop in the bucket. The rulers of the earth count for nothing. In the grand scheme of things, as we like to say, this election process really doesn’t amount to a hill of beans. It is much ado about nothing. Chaff in the wind, blown away on the slightest breeze. Our nation is struggling to maintain a way of life. We are trying to maintain a life we believe is built on free-enterprise, hard-work, and freedom. Some of us want it to be more so while some others of us believe in the power of the government to help us reach our goals. But in the end, who is in ultimate control? During her speech at the Global Leadership Summit, Condoleeza Rice shared that while she was Secretary of State, she would often ask the leaders around the table whether they were more concerned about today’s headlines or tomorrow’s history. Boiled down, her question is this: Are we shooting for the popular decision or the right decision? Over the course of the next 7 weeks we are going to be treated to a continuing barrage of ire and political mayhem. Then, we will know the leadership for the next four years. What will that tell us? Will it really tell us our future individually or collectively? Probably not. Whichever way the election goes, those grand and glorious campaign promises are going to be promptly broken whether because the promise was just a line to get the vote or whether “the other side” gridlocked the process. Decisions will be made both for the popular reasons and for the right reasons. And one person’s “right reason” is another’s “stupid reason.” That’s the way it is. Ultimately, it will all work out… because God is on His throne. In the meantime, I suggest a cup of tea and maybe a free cruise. On one of our weekly paths to and fro, the kids and I drive past a sign that advertises “Cherries, Coconuts, Fruts.” No, that is not a typo on my part. The hand-painted-on-cardboard sign is wrong. Yet, it has provided the kids and I a steady topic of conversation from “what is a frut, mommy?” to “why don’t they change it?” I love to hear my kids giggle and passing that sign always inspires a giggle. Then, there comes the inevitable, “Can’t we stop to buy a coconut?” I wish I could pinpoint the moment when coconut became the flavor-of-the-day for my kids. Coconut spread on toast, coconut milk, coconut in cookies or granola bars… they love coconut. The only time they weren’t thrilled with coconut was at the bagel shop when they picked up tetra-paks of coconut water. I managed to drink it for them (because I can’t stand waste), but I really couldn’t blame them. Blech! Imagine the excitement then when I announced that Compassion Tea would soon be carrying a new tea… Coconut Oolong! Although this oolong, like all other oolongs, has caffeine, this has become an early-in-the-day-only treat for the kids. As we would say if we were still in the Netherlands… LEKKER! I first tried the coconut oolong at Ed and Wendy’s house when we were all gathered for a Compassion Tea director’s meeting. Chris and Anne were taking us through the intricacies of cupping. Think wine tasting only with tea. First, you inspect the leaves, notice their color, smell, are they curled or cut, rolled or shaped. Then the tea is steeped for the proper amount of time. In a flick of the wrist, the leaves are left on the cup lid and the third step is to inspect the infused leaves asking yourself what has happened to them in the steeping process. How much have they uncurled? If the curl or roll is still fairly tight, you can probably get another couple of infusions out of them. Having done that, it’s time to look at the liquor, the tea itself. Cupping your hands over the cup, take a deep breath. Note the nose. My favorite part comes next! Remember your mom telling you not to slurp? Well, in tea tasting, slurping is necessary! Breathing in, slurp up some tea, let it roll around on your tongue before you exhale and swallow. The full flavor of the tea should hit and linger. Like wine, you can then assess whether the tea has tannins, how it finishes, and eventually what it takes like cooled off. When Chris and Anne announced the coconut oolong, there was an audible collection of breath, one of those oooooooo moments you might hear from a crowd expecting an amazing magic trick. The excitement filled the air. As we cupped our way through this tasting, the excitement grew. My notes indicated that the leaves had “beautiful curls” and were “consistent in color.” Both dry and steeped, the leaves gave off a rich, chestnutty aroma with a hint of a floral bouquet too subtle to completely identify. But, it is the lingering notes of coconut that make this tea truly marvelous. 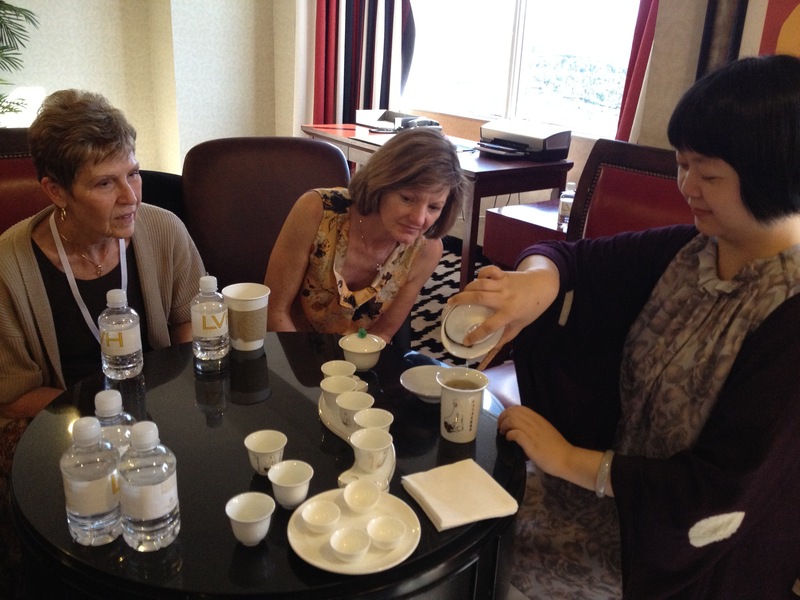 All of the Compassion Tea directors were making notes and rating the teas we tasted over the weekend. Wendy steered us to a quick way of marking the teas we wanted to carry… smiley faces. How funny it was to watch all 8 of us furiously scribbling smiley faces with hearts and extra smiles in our notes! I didn’t know much about oolong tea going into this experience. Here is a little of what I’ve learned. Oolong is primarily produced in China and Taiwan, although India and other tea producing regions are beginning to produce it too. Like green, black and white teas, oolong comes from the camellia sinensis plant; the difference is in the oxidation process. The Coconut Oolong is a tea blend. It’s base is a Taiwanese tea called Bao Zhong flavored with a creamy and smooth coconut flavoring. The Bao Zhong teas are known for their floral character, which comes from a unique natural process. Any time a tea leaf is bruised or cut in any way, it exposes the enzymes in the leaf to oxygen thereby beginning the oxidation process which gives the different teas their unique qualities. In the case of oolong tea, there is a green leaf hopper bug that visits the camellia sinensis plants and nibbles on the tea leaves. Those little nibbles begin the oxidation process before the leaves are even harvested. Once the bugs have left the tea garden, heading for another, the tea leafs, usually a bud and two leafs, are plucked, withered and dried, sometimes steamed, sometimes roasted, often rolled or shaped into pearls, and then finished off before heading to your tea pot. I should note that we also tasted and are adding Jade Cloud – an organic Fair Trade green tea, West Cape Chai – an organic Fair Trade rooibos that includes ginger, star anise, clove, fennel, cinnamon, cardamom, peppermint, black pepper, and ramon nut (a coffee-like flavor) to create a warm and spicy happiness, and the Bai Hao oolong without the coconut flavoring. Stay tuned! I intend to mix the West Cape Chai with some half-and-half and a splash of rum. I’ll tell you how it goes! The pronouncement against the flip flops was met with copious tears, a true flood and a resistance to reality. All over a pair of shoes. What else can be “useless?” Our dog Winston has rendered many things useless… from Legos to dolls, from buckets to fly traps. It almost makes one want to call him “useless.” But something stops us from calling another living thing “useless.” It certainly isn’t politically correct and it certainly isn’t Biblical. If we believe in a creator, who created us in His image, then certainly no human is less than remarkable. Apparently, this is a first world perception however. In places where living is tenuous and people need to work together to provide the minimal for subsistence, those who can’t carry their own weight are, by society’s standards, “useless.” Chris and Jack Faherty, Compassion Tea co-founders, were in South Africa earlier this month visiting two clinics CompassioNow supports (in part thanks to your support of Compassion Tea!) Dr. Karin Volker has been working at the Lily Medical Centre for about four months now. She offered to take Chris and Jack around and discussed with them several of the patients she has been helping. One particular woman, in her early twenties and handicapped, has been deemed by the community as “useless.” Unable to walk, she crawled where she needed to go. Her own family had refused to help her. Because of the lack of care she had received, the woman eventually arrived at the clinic sickened with severe infections. Dr. Volker has been treating her infections and has given her a walker… the first time anyone has offered to help this woman improve the quality of her life. But Dr. Volker is frustrated too. She told Chris and Jack that she had sent the woman to a nearby government clinic. Unable to run certain labwork at Lily, Dr. Volker hoped the government clinic could do it. The government clinic had the capacity, but refused to do the labwork because “it was unnecessary.” The woman was useless; why spend the money? “Wednesday morning we awoke to a very bright, cold day, (around 35 F). The conference center is a long cement block building with bedrooms on each side of the dark hallway. We were grateful for our warm showers but we ate breakfast wrapped in the blankets off our beds. The building never warmed up even with the windows open during the sunny afternoon. I mention this to put our community visit in perspective. For twenty years, this woman has heard words that labeled her as unworthy, unlovable, hopeless. A walker, some antibiotics, and a person willing to take the time to help must add some hope to a life otherwise considered worthless. I recently had the privilege of attending parts of the Global Leadership Summit and hearing Condoleezza Rice and John Ortberg speak. Rice spoke about her meager upbringing in the segregated south where her parents weren’t able to take her to the movies or to a restaurant. Nevertheless, they passionately imparted to their daughter that even though she “couldn’t sit at the counter at Woolworth’s” she might “one day become President of the United States.” That same child, who in the eyes of some would have been considered unworthy, potentially useless, grew up to become Secretary of State. It was a rousing moment at the Summit and I just heard Rice use it again during the RNC. Opportunity and hope are so powerful. John Ortberg’s speech focused on research he did for his latest book Who Is This Man? The Unpredictable Impact of the Inescapable Jesus. Listening to the speech and subsequently reading Ortberg’s book, I’ve been amazed at the impact of Jesus’ life. I’ve had the privilege of growing up hearing the stories of how Jesus healed through touch or mud packs or mere words people with leprosy, lameness, blindness, excessive bleeding, and disturbed minds. But in today’s world, where we have huge institutions that lobby and fund-raise for everything from autism awareness to prison care, Jesus’ care for humanity seems par for the course. Ortberg says no. He explains the social culture of the day whether it be Greek, Roman, or Jewish. And concerned about others they were not! Ortberg explains, “Anything malformed or defective was considered by Pharisees to be unable to reflect the perfect holiness of God. Therefore, nothing malformed was allowed within the precincts of the temple” and that translated to people’s homes as well (pg. 36 Kindle version). According to Ortberg, “Sociologist Rodney Stark argued that one of the primary reasons for the spread of Jesus’ movement was the way his followers responded to sick people” (37-38). “The idea that ‘the least of these’ were to be treasured – that somehow the Jesus that they followed was present in despised suffering – was essentially a Copernican revolution of humanity. It created a new vision of the human being. People actually took Jesus at his word” (39). And therefore, Ortberg suggests “… wherever you have an institution of self-giving for the lonely (and for practical welfare for the lonely), schools, hospitals, hospice, orphanages for those who will never be able to repay, this probably has its roots in the movement of Jesus” (44). Ortberg goes on to attribute libraries, hospitals, charities, democracy, abolitionist movements, and the rise of women’s rights to Jesus and His followers. Could these events, movements, institutions have occurred without Jesus? Possibly humanity could have gotten there eventually, Ortberg surmises. But we’ll never know because the world did have Jesus and continues to have His followers. I can’t speak for Dr. Volker’s inspiration, but I can speak to the founders of Compassion Tea. As followers of this man named Jesus, they have publicly declared no life useless. Daily they strive to improve the lives of those in Africa deemed so and they support the people on the forefront of the fight to bring hope and health to people who are otherwise considered worthless. That is what Compassion Tea is about; we share tea in order to save lives… because no life is useless. What do you remember from your college days? I was watching via Facebook as the new students at Wittenberg University, my alma mater, arrived this past week. New Student Days… unpacking, bonding games with your dorm mates, learning the campus, and figuring out the food options… ahhhh, the good old days! Actually, that first year, probably the first month or two, everything felt so foreign. But by the end of my four-year tenure there, I owned that place! It sure felt like home and with the added independence of having a car on campus I knew Springfield and Yellow Springs quite well. It almost seemed incomprehensible that I couldn’t just stay at Wittenberg forever, cruising over to Young’s Dairy for an ice cream, watching the independent films in Yellow Springs, pontificating about literature with my favorite professors, sledding in the Hollow, or watching movies under the stars there, and best of all, chilling with my besties. But, I had a wedding and a new job and a new house waiting so onward and upward! My college years were the ones that introduced me to tea. I can’t quite put my finger on exactly what started it, but I remember having a brutal sinus infection my sophomore year and the only thing that kept me going was that giant tumbler of tea I carried to earthquakes and volcanoes honors science and to philosophy first thing in the morning. I must have had a hot pot to heat the water and Lipton was no doubt my tea of choice. After all, I was only a poor student! Yep, tea and my mom’s butter cookies… manna from heaven! If this is making you feel nostalgic at all, you’ll be happy to know that Compassion Tea is introducing a new membership, our 9-month student membership! This membership covers the school year and is perfect for a parent, godparent, grandparent, or friend to gift to that special student heading back to the hallowed halls of learning. 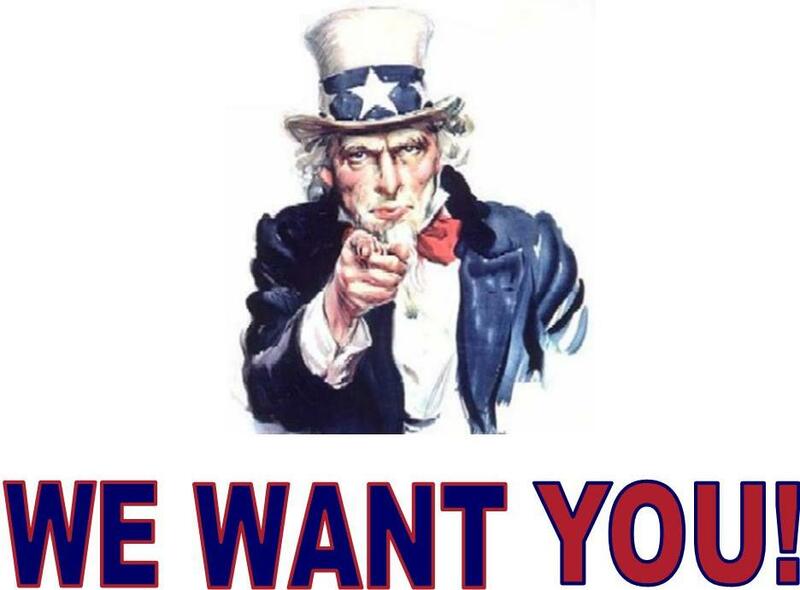 All you have to do is head over to our website (click here) and sign that special someone up for the 9-month membership and we’ll do the rest which includes sending two pouches of specially selected teas (about 50 to 60 infusions per month) directly to the student at his/her mailing address on campus. Just think of it as a warm fuzzy delivered to your student’s door monthly! And don’t forget the added bonus of also saving lives through this membership. Your purchase of a membership will help us send life saving medical supplies and medicines to “the world’s least served” in Africa. Let’s give it the “old college try” and see how many student memberships we can get, how many students’ lives we can warm, and how many lives we can save! Anne and Chris watch as Didi pours another infusion of her family’s pu ‘erh tea during the World Tea Expo held in Las Vegas in June. “I was sitting in the hospitality room at the hotel, sipping wine, relaxing, and keeping to myself,” reminisced Lee Kennedy recently as he retold of an amazing experience he and the other founders of Compassion Tea Company had at the World Tea Expo held in June in Las Vegas. “And then Anne walked in and started doing what Anne does best,” he continued, sitting back in his patio chair. The people around the table chuckled because we all know what Anne does best; she’s a master at creating relationship where there is none. Anne Kennedy, Lee’s wife, picked up the thread of the story. “There was an Asian man sitting near my husband and we started chatting.” And in the course of the conversation, they realized they were both there for tea. As Anne relayed some information she had just learned, the man became increasingly excited. As it turned out, the man was Professor Kanzo Sakata from the Laboratory of Molecular Bio-catalysts, Institute for Chemical Research, at Kyoto University in Japan. He specializes in the development of floral aroma during the production and processing of oolong and black teas. He works with the Japanese government to assist Japanese tea makers improve the quality of their teas, and Dr. Sakata was the one who had studied the impact of a certain leafhopper insect on the leaves used to make oolong teas; his published study was exactly what Anne was relaying. Immediately, a bond was formed. With Dr. Sakata was a Chinese student named Didi Liu. A foremost expert on pu’ erh (pronounced poo air) teas, Didi was leading a class in these teas at the expo the next day, and she urged Anne and the other Compassion Tea directors to attend. The group of directors consisting of Lee and Anne, Chris and Jack Faherty, and Ed and Wendy Bjurstrom also met Didi’s parents who own a tea garden and a tea production business in the Yunnan region of China. The Liu’s purchased the land for their garden when they saw tourists trampling hundreds–of- years-old tea trees. Their tea garden contains tea trees that are roughly 800 years old and this age lends great flavor and value to the pu’ erh tea they produce. The following day, the Compassion Tea directors headed to Didi’s seminar but found it sold-out and closed. Disappointed, the team strolled off to other parts of the expo. Later, they saw Didi again in the hotel hospitality room and shared their disappointment. Didi, also disappointed her new friends had been unable to attend the class, offered to serve the team tea. What ensued turned out to be the highlight of the expo for the entire team. Joined by Dr. Sakata and Jane Pettigrew (an English tea guru who leads many seminars on tea), the team spent the next hour and a half in near silence punctuated by commentary about the pu’ erh tea and the ceremony itself. Didi’s mother prepared the water and cups in the background while Didi quietly and gracefully led the team through multiple cuppings and infusions of her family’s own pu’ erh tea. The cups she used had been designed by her mother especially for the ceremony of tasting pu ‘erh tea. The team described the ceremony as “purposeful,” “delicate,” and “gentle”… each participant receiving a thimble-full of tea to taste after each infusion. Chris remarked at her amazement that one serving of tea leaves could change and develop so markedly through multiple infusions, the leaves offering new colors and flavors with each steeping. Truly, they were in the presence of a great pu’ erh tea. At the end of the ceremony, Didi presented each couple with their own cake of pu ‘erh tea from her parents’ garden and pressed in the ancient tradition by a stone weight. She instructed them to save the cakes for 5, 7, and 10 years, sampling one at each milestone. Pu ‘erh tea, because of the microbes introduced into the tea, ferments with age; like a fine wine, this is what gives the tea it’s uniquely dark, earthy color and flavor. The team views these teas as priceless. The team felt that in sharing her tea and the ancient ceremony, Didi had shared herself, had built a relational bond, and had passed on an ancient art form. They spoke of the privilege, the contrast between our fast-paced American culture and the purpose of the timeless ceremony connected to the past and connecting them to their new friend. They spoke of the “fullness of being together,” of sharing, of passing the tea cup, of relationship building… all things we at Compassion Tea knew tea could mean for people and part of the reasoning behind our mantra, “Share Tea, Save Lives.” Tea brings people together, inspires meditation and communion and relationship, and provides a platform for revealing the true self. I could hardly contain myself. Rarely does Bible study and “real life” coincide so dramatically. Here I was on a plane with a cross-section of humanity, many of whom felt that they had been abused in some way. Their sense was that they were entitled to some sort of gift or reward for putting up with the inconvenience. But what if we had flown with that lost screw, what if the wing panel had wiggled off? What about the safety issue here? It wasn’t like the airline had unscrewed the screw just to spite their clientele. Maybe it was entirely a God-thing… a protection for us all from injury and/or death. In fact, I believe completely that’s what it was. When I reunited with my family and the kids asked what had happened to delay Mommy’s return I explained just that… that God had protected the people on the plane and me from injury. Screwtape and his friends very well could have distracted the crew from noticing the lost screw (is anyone else enjoying the further coincidence of the lost screw and the author of the letters, Screwtape?). Let’s take this a bit further. If God gave us time, money, energy, everything, then we have some very important choices to make in how we spend our time, money, energy, lives. I’ve heard it said that what we spend our money on reflects where our heart lies, what we value. How we spend our time, especially our “free time” also reflects what we value and where our heart lies. Do we make room for God’s work in “our” time? Do we use “our” money for God’s work? Or do we simply use our time and money for our comfort? Buying a Compassion Tea membership does in fact provide for our own comfort, but it also saves a life. Talk about having your cake and eating it too! I keep getting distracted. I should be writing a blog but then there are the dishes in the sink, the dog is eating a pencil, a shoe, a new Lego set, fill in the blank, the children are fighting again over trivialities which may really be a cry for Mom’s attention, and oh look at that pile of laundry over there. But wait, we’re late for a play date, a haircut, a camp, a show at the library, the dentist, fill in the blank. When I get home, there are the chickens to deal with and the dog will need some play time too. I’ll squeeze in that email response and maybe check Facebook and then cook lunch, dinner, fill in the blank. The distractions are fast and furious (yes, even politics as the election cycle heats up are getting to be distracting because one must be an informed voter). And then I sit down and read my Bible study material … the assigned letters from C.S. Lewis’ book The Screwtape Letters wherein one agent of the Devil advises his nephew on the best ways to prevent his patient’s complete and total conversion to Christianity. Tactic #1? Keep him distracted and unable to act. If the nephew can keep the patient focused on the minutiae and never on the big picture, on the little idiosyncrasies of the person in the pew next to him instead of on the bigger view of the sinfulness of all men, on the future fears instead of the present joys, on the daily grind rather than the vastness of creation, then the patient will be mired in the Devil’s bog rather than walking freely in the light. Distraction. The Devil’s number one tool and I’ve got it bad. Last week was Bible School week at our church and this year’s theme was “Daniel’s Courage.” Based on his faith in God, Daniel stood up to countless attacks on his character and his God as did his famous friends Shadrach, Meshach, and Abednego and not so surprisingly God came through saving the foursome from such things as fiery furnaces and hungry lions. What really struck me this go around for the book of Daniel was the discipline with which Daniel lived his life. His wasn’t some haphazard, willy-nilly religion that came into play when convenient. He was disciplined to eat God’s food, not the King’s delicacies. He was disciplined to continue prayer despite attempts to make such action illegal. He was disciplined to turn to prayer when times were going great and when times were dire. It seems to me, discipline must be the answer to distraction. Intentionality and focus chase away distraction. ‘you’re welcome’, and I learned respect for others. you thought I wasn’t looking. Doesn’t it just make you want to cry? Seriously, though, there is intentionality in all of those actions and despite the littleness of some of them they do speak volumes to the state of the heart. Now to tie this all into Compassion Tea and CompassioNow. I received an email this week, the minutes from a meeting of the board for Mission Medic Air in Zambia (www.mma-zambia.org). This organization flies doctors into the bush to host monthly clinics in places where there are no doctors. Mission Medic Air is supported by CompassioNow, who has provided funds, a new engine for the crucial airplane that gets the doctors into the remote areas of Zambia, and medical supplies, This past spring, Mission Medic Air hosted a Smile Train camp at a local hospital. During the six days of the camp, 45 patients were seen and treated. That number may seem low until you understand the scope of the camp. Smile Train (www.smiletrain.org) is a charitable organization dedicated to changing the world one smile at a time by providing free surgery to fix cleft palates and lips to families who can’t afford to have the procedure. According to their website, 170,000 children are born yearly world-wide with some sort of cleft. If it is left unrepaired, it can prevent a child from eating and speaking. In many parts of the world, the social stigma that follows a child with cleft is that he/she is cursed; some are even killed or abandoned immediately after birth. So, through the intentionality of Mission Medic Air and Smile Train, 45 children in Zambia were given new life as their clefts were repaired. Already, Mission Medic Air has about 20 other cases signed up in hopes there will be another such camp in the near future. This made me think of the intentionality of my support of Compassion Tea. Sure, it would be easy to just grab a box of sub-quality tea at the grocery store while I’m there. Or I suppose I could choose to intentionally go to the mall and spend a wad of money at a very lucrative certain tea source there. But in signing up for a Compassion Tea membership I’ve added convenience (now my tea shows up in my mailbox), variety (I get to try teas I might not have thought to try), and that social justice element that only Compassion Tea offers… providing life-saving health care to people who need it desperately. When I don’t think anyone is looking, my children will see me baking with or drinking the tea. They enjoy it too. And they are growing up hearing the stories of children in other parts of the world that don’t have it so good. I guess what I want to get across here is that in our world of distractions and grind, we can act intentionally in ways that have lasting effects on our own little corner of the world as well as on the wider world. It may take discipline, but the blessings that follow are immeasurable. Just as a note… in the course of the time it has taken me to complete my ramblings, Winston the dog has shredded an inflatable ball and a gift bag and has emptied the contents of 2 trashcans consuming what he could ingest. Distractions.